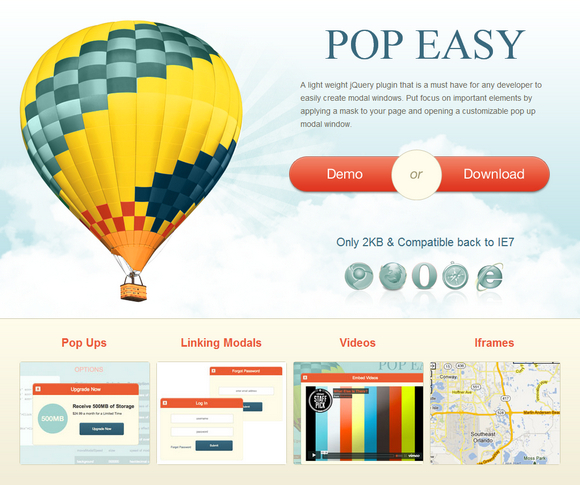 PopEasy is a light weight jQuery plugin that is a must have for any developer to easily create modal windows. Put focus on important elements by applying a mask to your page and opening a customizable pop up modal window. To use multiple modals on one page, you must sync the href attribute of the trigger to the id of the div you wish to open. This works the same with transitioning from one open modal to another. Just place a link in the modal you wish to leave with an href attribute matching the id of the next modal.